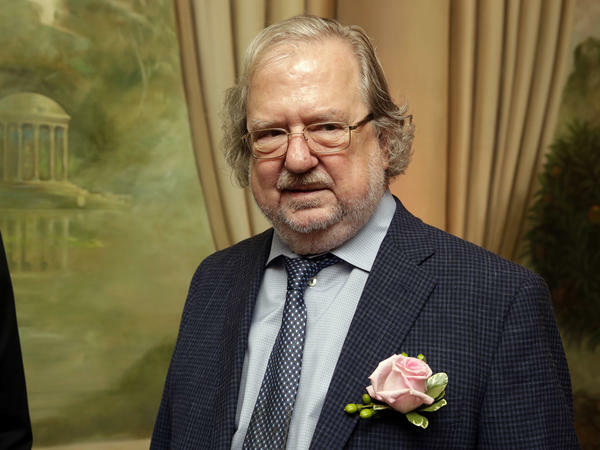 Dr. James P. Allison, University of Texas MD Anderson Cancer Center, poses for a photo in New York in 2015. Allison and Tasuku Honjo have jointly been awarded the Nobel Prize in medicine or physiology. Allison, 70, is currently chair of the department of immunology at MD Anderson Cancer Center in Houston. Honjo, 76, is a distinguished professor at the Kyoto University Institute for Advanced Study and a professor in the department of immunology and genomic medicine at Kyoto University in Japan. They worked separately on the same problem: figuring out how the immune system helps protect us from cancer and how it can be supercharged to mount an effective response. Jim Allison, as he is known, did his key work at the University of California, Berkeley. His focus was a key part of the immune system called T cells. "When I started working on T cells, nobody understood them at all," he said at a news conference today. They rev up to respond to cancers and other diseases, but they also have a mechanism that slows them down to prevent an overreaction. Allison discovered a molecule called CTLA-4, which served as the "brakes" for T cells. So Allison had an idea: "Let's just disable the brakes and see if that will allow the immune system to attack cancer," he said. "And it did." Speaking to NPR in 2016, Allison said in his experiments on mice with cancer in the 1990s, he tinkered with the CTLA-4 molecule in the rodent's immune system. The results were astounding — tumors disappeared. "I've been doing this sort of stuff for years, and I'd never seen anything like that," Allison said. "And I thought, 'If we could do that in people, this is going to be amazing.' "
That discovery led to the development of a whole class of drugs, called immune checkpoint inhibitors, which are a potent way to treat some cancers. (The first drug based on his discovery is Yervoy). These drugs are remarkably effective for a minority of patients who get them. For example, former president Jimmy Carter's treatment for a dangerous skin cancer, melanoma, that had spread to his brain included a checkpoint inhibitor. His response was remarkable. "The reason I'm really thrilled about this is I'm a basic scientist," he said. Though his mother died of cancer when he was a child, Allison said, "I did not get into these studies to cure cancer." Across the Pacific, his colleague Tasuku Honjo was also figuring out how T cells work. He discovered a second set of brakes, called the PD-1 pathway. Drug developers came up with potent medicines to target those brakes. Those drugs, such as Keytruda and Opdivo, are now widely used drugs to treat many different types of cancer. The Nobel committee cited Allison's study of a protein called CTLA-4 that functions as a brake on the immune system. By releasing this brake, the body's own immune system can be stimulated to attack tumors. Together, these checkpoint inhibitors represent a whole new class of cancer treatment, above and beyond the standard approaches of using chemotherapy, radiation and surgery. Scientists had previously tried to harness the immune system to attack cancer, but this approach was far and away the most effective. Allison says the Nobel committee told him that it's the first time the prize for Physiology or Medicine will be awarded for new cancer treatments (though other prizes have rewarded fundamental understanding about the mechanism of cancer). Though some patients have remarkable responses, these drugs aren't cures for most people who take them. Survival can sometimes be improved by combining these drugs, or by including them in treatments that involve chemotherapy or radiation. There's a worldwide scramble to run tests to find potent new combinations. "So we still have a lot of hard work to do," Allison says, "but the optimism comes from the fact that we know the basic rules now." The prize is worth about $1 million and will be split between the winners when it is awarded Dec. 10, the anniversary of Alfred Nobel's death. Two scientists simply curious about understanding how our immune system works ended up making discoveries that rocked the world of cancer treatment. The Nobel Assembly in Sweden today announced that two men will share this year's Nobel Prize for Physiology or Medicine. NPR's science correspondent Richard Harris has our story. RICHARD HARRIS, BYLINE: Jim Allison says he's always had a personal interest in cancer. His mother died of lymphoma when he was 10, and an uncle died of lung cancer. But when Allison went into science, he did so because he was curious about how the world works. That curiosity led him to an honor many around him had been expecting him to get, the Nobel Prize. JAMES ALLISON: The reason I'm really thrilled about this is I'm a basic scientist. I did not get into these studies to try to cure cancer. I got into them because I wanted to know how T cells work. HARRIS: T cells are a vital component of the human immune system. But when Allison started out, he says, people simply didn't understand what they did. In the 1990s, Allison was working at UC Berkeley when he discovered a vital element of T cells. They had what's essentially a brake pedal to keep them from going too crazy. ALLISON: I said, well, let's just disable the brakes and see if that will allow the immune system to attack cancer. And it did. HARRIS: This breaking system is called a checkpoint. And once Allison discovered this mechanism, drug developers set to work creating drugs to block checkpoints, drugs called checkpoint inhibitors. Meanwhile at Kyoto University in Japan, Dr. Tasuku Honjo was independently at work on the same biological puzzle. He discovered another set of T cell breaks, so he shares the Nobel Prize. From this science has emerged a multibillion-dollar effort to develop market and improve checkpoint inhibitors. ALLISON: What I was told by the Nobel committee when I was called this morning - that this was the first prize they'd ever given for cancer therapy. They've given some for - the causing cancer before, but this is the first time for cancer therapy. HARRIS: These checkpoint inhibitors have led to some remarkable successes. For example, former President Jimmy Carter was diagnosed with advanced melanoma which had spread to his brain, but a checkpoint inhibitor vanquished his cancer. Dr. Monica Bertagnolli, president of the American Society for Clinical Oncology, says checkpoint inhibitors have generated tremendous excitement because of remarkable stories like this. MONICA BERTAGNOLLI: Unfortunately, that is still a small percentage of patients. HARRIS: The race is now on to figure out how to make these drugs effective in a lot more people with a lot more types of cancer. Jim Allison, now at MD Anderson Cancer Center in Houston, says now that they understand the basic rules, they can set to work on improvements. And he for one is optimistic that this new branch of cancer treatment will end up saving many more lives. Richard Harris, NPR News. Transcript provided by NPR, Copyright NPR.